I ordered a Woodware Sausage Dog stamp and it was bigger than I'd expected - so I decided to see if I could use it as two dogs. The sentiment is by Hero Arts. I've noticed dogs use a different way of greeting each other than we humans do- so I hope you find it amusing rather than offensive. Haha, what a brilliant fun use of this stamp, love how you stamped it as two dogs, so clever! 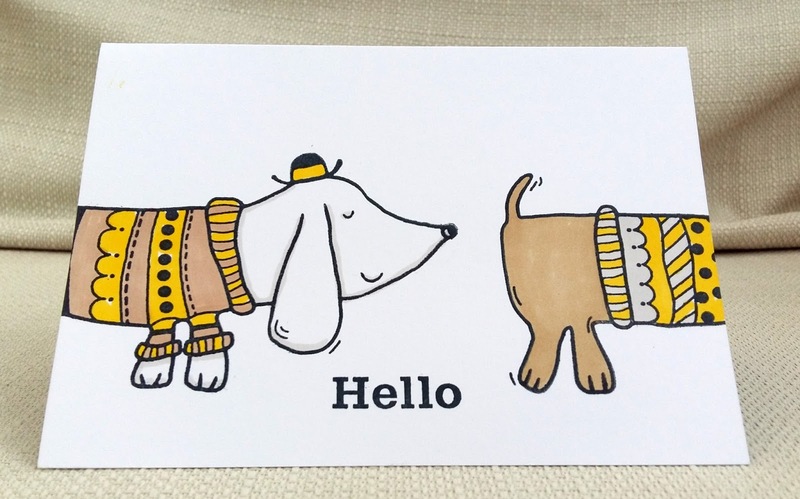 Oh wow, what a great way to start off my commenting for the Sisterhood, a dog's bottom-sniffing card! Perfect timing for me - this is so very funny and a great way to use the stamp. Spot on! Hee hee! This is such a fun card! firstly may I say what a beautiful name. Your card is wonderful and what a great idea that wonderful stamping of the 2 imahes. Fabulous card! I love it! Thanks for the giggle!! A card where the snark comes naturally is always good! What a great way to use this stamp. Thanks for joining the fun at the Sisterhood of Snarky Stampers! A beautiful snarky card! What a great way to use this stamp. Thanks for joining the fun at the Sisterhood of Snarky Stampers! Great idea, it looks so much better than as one doggy on his own, a clever move stamping off the edge Marina! This is so fantastic! Your design is so clever and I love how you colored your doggies! Thanks so much for joining us at CAS-ual Fridays! Fabulous card, love it sure did make me giggle. Thanks for playing along with us at the Sisterhood of Snarky Stampers for the H is for Hounds challenge. Oh Wow..I absolutely love this card! such a clever way to use the stamp. It's fun and quirky... also perfect for our CAS theme! Thanks for joining us at MAWTT! What a wonderful Creation, and I LOVE your sense of humour! Thank you for sharing your awesome creation with us at the Sisterhood of Snarky Stampers "H" is for Hounds Challenge! I love it. Making one stamp into two is a great idea. Thanks for barking with the sisters this week. Fab idea to use one stamp to make two dogs! Genius idea and what a fabulous card!! Thanks for joining us at the Sisterhood of Snarky Stampers!